No destination is quite as difficult or fun to plan as Disney World. That's why I've always had a planning binder full of info and printables to keep me organized. 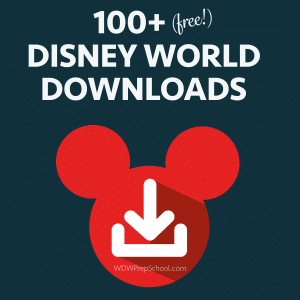 Below, I have shown the sections I use for my Disney World binder and links to downloads that you can use to create your own. The company that I used to order my binder and tabs is no longer available. However, Disney's Zazzle store also has hundreds of cute binders that can even be personalized (and they cost about 1/4 of what mine cost). Expand the area below to see some examples that I created when playing around with their options. Note: Zazzle won't allow you to use the phrase "Disney World" on your design anymore, but I'd suggest "WDW" along with some other text (such as "WDW trip") as an alternative that they will allow. How I did it: the red spine and Mickey patterns are part of the style already. I uploaded the front label and back stripe images and then used Zazzle's text tools to add text to the front, spine and back. For the front, this meant having two layers: one for the label and one for the text. Just drag the layers on the Zazzle site to make sure the text lays on top of the label. There are literally hundreds of choices of binders. Note: If items are purchased by clicking on one of the Zazzle links above, Zazzle will send me a referral fee. Of course, you can pick up a binder wherever office supplies are sold and make your own cover for an inexpensive way to create a personalized one at home. Want a digital binder instead of (or in addition to) to a physical binder? You can use Evernote to do that. Watch the video for details. In the general info section, I include a map of Walt Disney World as a whole, our trip itinerary, a calendar of the year so I can jot down dates that I need to remember (like making ADRs 180 days in advance) and a chart of which parks are best on each day of our trip. Although the trip plan should mostly be decided beforehand, it's nice to stay flexible and make changes as needed (plus, I like to let the kids choose what we do on the last day so that's a helpful chart to have as a reference). 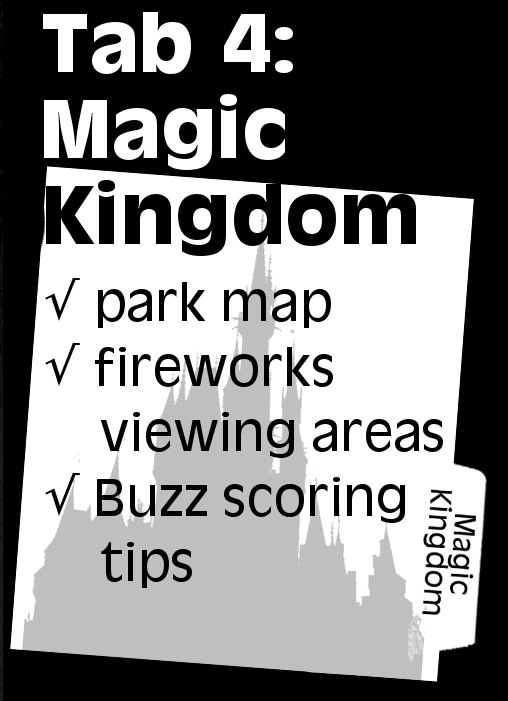 In the Magic Kingdom section, I keep a park map, touring plans and recommended viewing spots. I also like to keep a list of recommended Quick Service dining locations so I know where to head when it's time to eat. My custom park maps (linked below) include all of that info on 1 map that prints out on 1 piece of paper. 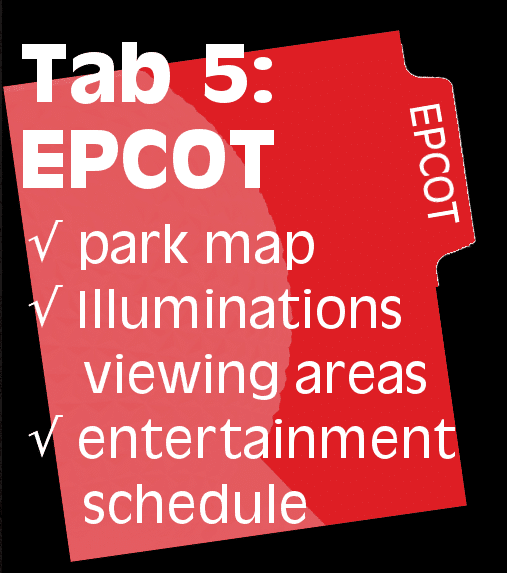 For Epcot, I like to have a park map, touring plans, and the entertainment schedule (especially since there are so many entertainment options in the World Showcase). 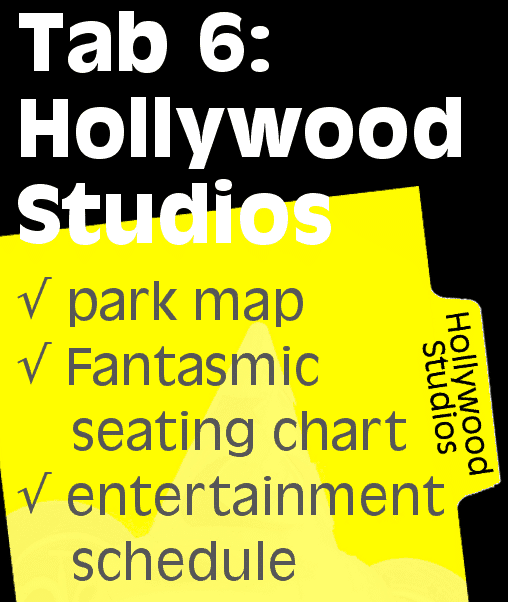 Not only do I like having a park map and touring plans for Hollywood Studios, but I especially need the entertainment schedule since there are so many shows in this park. 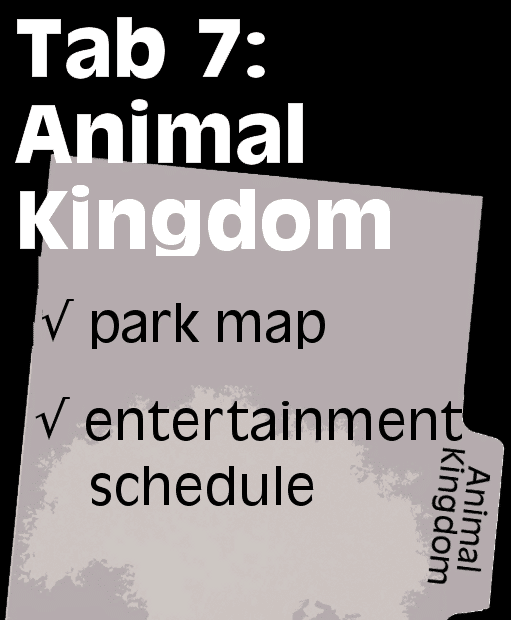 As with the other parks, I include a park map, touring plans and entertainment schedule in the Animal Kingdom section. 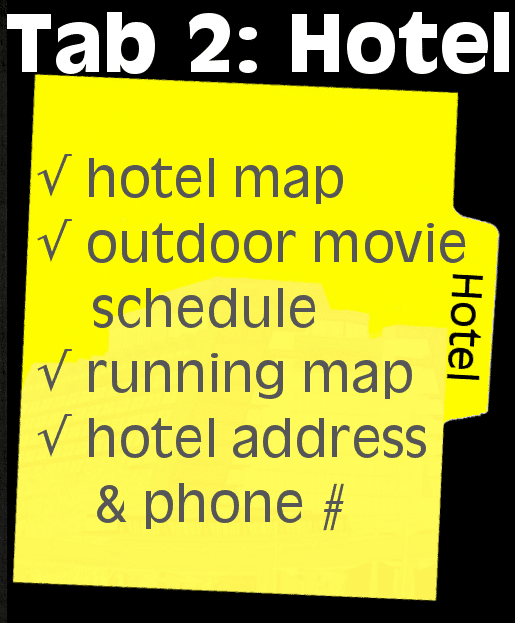 In the hotel section of my binder, I put a map of our hotel and things specific to the area (walking paths, viewing locations, etc.). You may also want to include a general page that includes contact info for your hotel. You can find the address and phone number info here. After deciding where we want to eat, I print off menus to store in this section so my family has an idea what to expect at each meal. I also keep a 1 page worksheet that summarizes all of our dining locations and includes our ADR numbers. For people using the Disney Dining Plan, having a worksheet to keep track of how your credits are being spent is a good idea too. 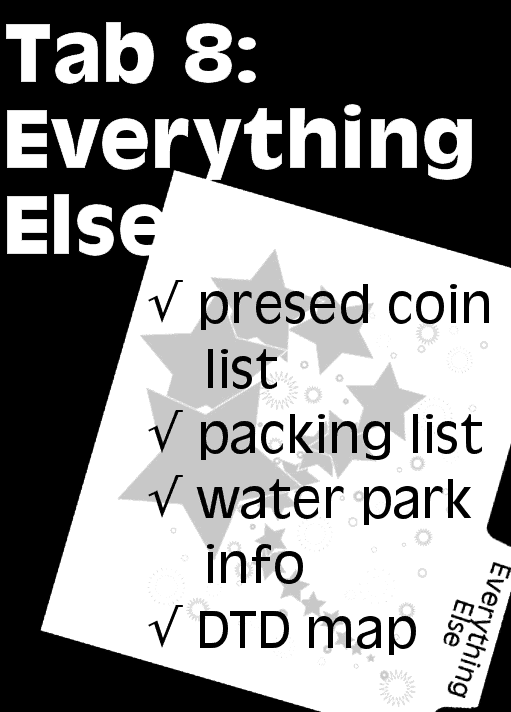 This section includes all of the other miscellaneous stuff that doesn't get its own section: water parks, Disney Springs, pressed coin info, packing lists, etc. Is there a way to dlownload these all at once? No, there isn’t. Many/most of them link out to external sources that are updated all the time. Best to just snag the downloads you find useful. Do you have a link where we can find the updated recreation calendars for the resorts? We won’t be going for a year or two and I was wondering if there’s a site where I can check this when it gets closer to our vacation time. The links posted are updated monthly by Disney, so you can use those. Do you have 2018 stuff? This is amazing, are you going to update it for 2018? Love this!!! This is wonderful. Being I wouldn’t want to carry anything extra I am going to try and load these forms and informtion into my Onenote app that way its always with me. I can carry this as backup in a suitcase for review. Thank you so much. Hi! Thank you so much for putting this together! I’m trying to print the map of Magic Kingdom but the link doesn’t seem to be working? It loads for me, but Disney’s links can be weird sometimes. Try to refresh the link if it doesn’t work and see if that will load for you. It looks like the tabs other than for General have disappeared again? Strange! I still see them all on my end. Can you try to hit shift-reload or view in a different browser to see if that helps? Any ideas for the dividers/tabs? I have my binder designed based on your instructions above! I also bought some cute postcards to use. Signing up for the 30 day free trial of zazzle black made shipping free. The epcot map link isn’t working?!?! Disney keeps changing the URL of the map. Here’s the current map for Epcot. I found a code for zazzle it is 20% off if you use ZAZZLEDISNEY. 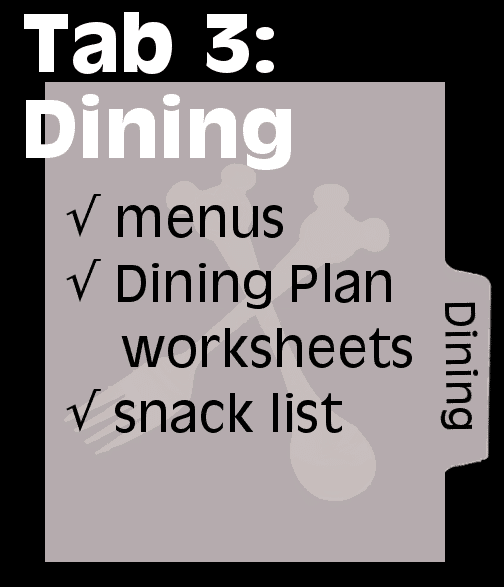 I love the binder idea, and I’m going to print out a lot of the downloads, but I was wondering, where are the printouts for the hotel and dining tabs? Good question! They seemed to have disappeared for a bit, but they’re back now. The links I posted above for each resort’s recreation schedule are updated every month by Disney, so check back and the link above will say May when it gets closer to your trip dates. When will the October park schedule/hours be updated? Any day now! We’re waiting for the hours to come out. Thanks… I’ll keep checking back… getting excited about planning my October trip!! No calendars after July 2017 have a working URL. Hi there! I was trying to click on the links for the park hours calendars, but none of them seem to be working…? I’m planning a trip for my boyfriend and I for May of 2018 already too! I hope your family and you have a great time. Shannon, do you have a pdf for the Kidani Lodge at the Animal Kingdom Lodge? You can use the same recreation schedule as AKL. They combine it into one calendar. You are SO flipping awesome! I was going to buy a filler for an old WDW planner I had but this is SO much better. I did in fact go to Zazzle and personalized the Retro Mickey one for us. Thanks again! I am going to take advantage of WDW Prep School gold level. When will this be updated for 2017? The links almost all point to the most current version of the files so there’s nothing to update on this page. The links will automatically point to new content as it is released. Thank you for putting all of this together! Trying to get a feel of what POP Century does in January for Recreation activities. Would you happen to have a copy of 2016 POP Century Rec. Act. or are they pretty similar every month? When will calendars and menus etc. be updated to 2016 instead of 2014 and 2015? All of the links are the newest information that’s available. Where did you find your Disney dividers? I designed them, but as I mentioned in the post, the company that I used to order my binder and tabs is no longer available. Where can I download the activity calender for All-star sports for the end of August beginning of Sept? The link above is automatically updated by Disney every month. Check back closer to your trip dates. Is there anything like this for California Adventure and Disneyland? I use all this info every time we go to WDW but I am at a loss for CA. Help!! DLRPrepSchool.com is run by my friend Casey and has lots of info, though I don’t think she has a download post like this one. Amazing! I can tell you put a lot of time and effort into all of this and it is so generous of you to share it. Thank you thank you thank you!!!! Just an FYI, I tried to order a binder from Zazzle and used WDW as the text instead of Walt Disney World as suggested but my order could not be processed due to conflict with their content guidelines. I didn’t add anything else to the binder so the WDW is all that could have been in conflict. Just wanted to put it out there for anyone else who reads this blog. I love this blog though and it has been super helpful in planning my upcoming Disney vacation so thanks! Hey Shannon, I have tried and tried to customize the red and black Mickey binder. How do you customize it? I can’t find out how to put our name on it. Why do you suggest packing AAA / value cards for the day-pack at the parks? Does anyone have a binder and tabs from the paper store exact to the binder and tabs shown on this site that would want to re-sell? We are going in 2016 and the paper store recently switched their minimum quantity to 10. I also would love to purchase any re-useable tabs. I love the ones that are posted! I was curious if you ever found anyone who had the pictures dividers. I have a binder but would love to have the dividers/tabs she has but I don’t want to order 10 sets. Love this idea!! I pinned it a few weeks ago and it worked but now your info link on how to order your tabs and binder is giving me a dead end. Any idea of how to access it now? Thanks so much!! Looks like the whole website for that company is down right now. Not sure if it’s permanent or a temporary glitch. How often does Disney update their maps? Our trip will be December 25th- January 3rd, want to make sure my binder is up to date! Most of the PDFs link to the files that are constantly updated so the links here will work as Disney publishes new info. This is amazing! Everything I wanted ALL in one place! Thank you!!!!! There is also something called PassPorter. It’s written by a family of 5. It’s got all kinds of great info, pockets in the back to put tickets and maps and thing, you can write it it and use a highlight as well. 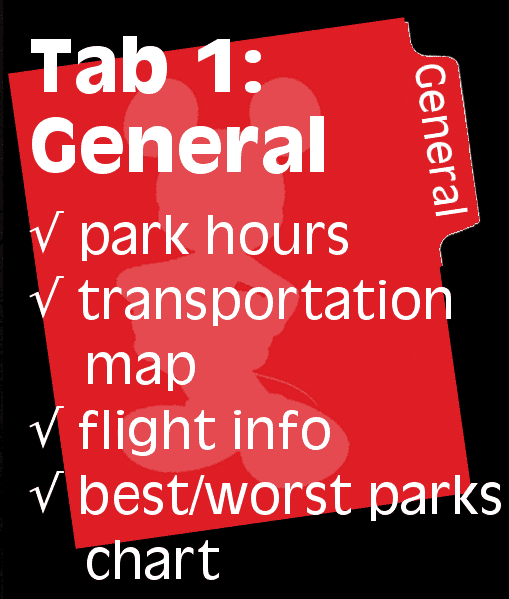 I also use tabs to mark important places. It comes with a fold out map of each park as well. All in color. It’s around $25.00 plus tax. I got mine at Books-A-Million. They come out with a revised version every year, and are also working on one for everything to do in Orlando BUT Disney, if you’re interested in going to other parks. It’s also small enough to fit in a small bag, so you can take it inside the park with you!!! The nice thing about the passporter is if you include a page on what you did every day, our school accepted this as “the journal” that your kid has to keep for educational trips! Is there anyway to download or buy the tabs? They are super cute! Instructions on how to buy the tabs are in the post with a link that has more info on them. This page was so helpful for planning my family’s Disney trip! Especially the packing list and the binder tabs. Thanks for doing this! The “Disney World Map” doesn’t link to the one pictured, but to their zoomable version, which doesn’t appear to be (easily) printable. Wish I had spotted this before spending THREE HOURS trying to design my own tabs on their extremely difficult to use design tool. Hi there. wow this is so helpful. Is this all up to date and current for this year? We go on our first trip with toddlers this October. No, actually, some of this stuff, like some of the maps, is out of date. I love the site and think she is doing everything right, but the truth of the matter is that it is near impossible to keep every single thing up to date. Use her tips about what to include and then look for the information on your own to confirm that you are getting the most timely information for your binder. Which maps are out of date? The park maps link right to Disney’s servers so they’re as new as they can be. Unless you’re talking about other maps? Where can you find the custom Disney tabs?? Ordered my customized binder. Now I won’t have all these loose pages. When we get home from our trip I will transform it into a keepsake scrapbook with memory Maker pics and journaling! Just wondering if these zazzle binders work with project life dividers? Thank you! I’m so overwhelmed. I wanted to make a binder but had no idea where to begin. Having it all in a hard copy I can flip through will make me feel so much more in control of this situation!! Thank you! What templates did you use for the dividers? I have gone to the website but I don’t see anything to choose from. 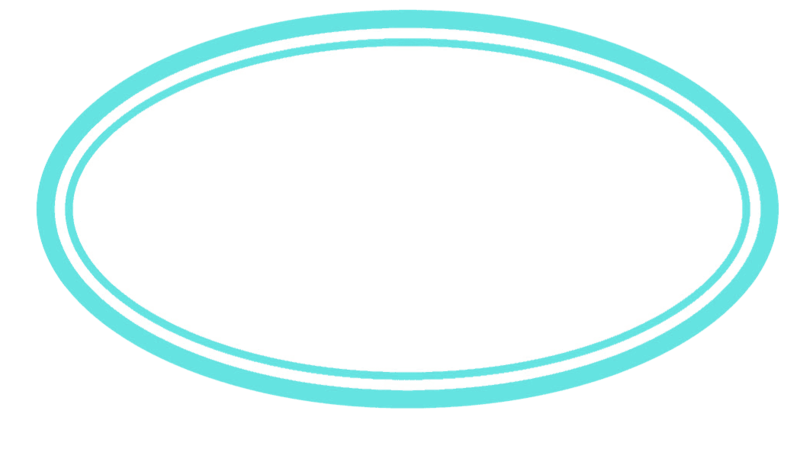 I ordered my binder from zazzle using your link and fell in LOVE with it 🙂 my question is on the dividers….I have found the website but cannot seem to find cute clipart like yours. Where did you get the cute images on the dividers? 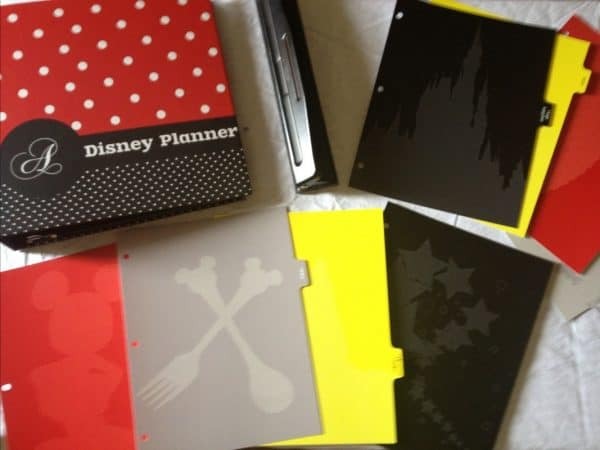 I looked on the website for the dividers and I don’t see the disney tabs. Are they pre-made? I designed the tabs myself. They aren’t pre-made. Oh dear, I am not that creative and have no idea how to design them. Where did you get the images? Thanks! Do you sell them by any chance? Wow, thank you so very much! I don’t feel as overwhelmed about planning my Disney trip now that I have found your website. You rock! This is awesome. Thank you so much! I love this! I’m planning my first trip, and I really like this! Any idea when the 2015 calendars may be available? Thanks for the hard work! Thank you for making this available to us. Your print outs make it so easy. I tried the paper worker site and I couldn’t figure it out for anything. I really want tabs like you have in the photo above. I can’t find a site for a printable front cover. I could try to make my own if I can find a way to use Disney font. I LOVE THIS! Thank you so much for all the hard work you obviously put into this. I cannot wait to build my own Disney Vacation Bible. Thank You! Thank You! Thank You! Do you carry your binder around with you to all the parks? Nooooo. On my first trip, I had it in my hotel room and would review it each night. Now the info is all in my head. The planner in me LOVES this! How did you design the red and black polka dots on yours?? I’ve been trying to do something similar, but keep getting errors that the images I use may come out crappy. Im think I’m more excited than when I planned my wedding!!!! Where am I able to download the binder tabs? They are just so cute I don’t want to use any other ones. I designed them on ThePaperWorker.com. Is there anyway you can upload the images that were on your binder tabs? I want to use the exact same ones because I just fell in love with them!!! Info on how to order my tabs is in the post. I ordered my binder from zazzle in November and found out today in that they canceled the order due to copyright issues of the words “Disney World”. Customer service said they cannot use the words “Disney” or “Disney World” due to copyright laws. How did you get around this with having “Disney” printed on your binder? I would just use “WDW” instead. I wish this issue would be addressed in this blog post so others don’t make the same mistake. I just made my Zazzle binder only to read this comment (and another comment from Oct) with this same issue. Disappointing. Just added that note to the post. Oh no, I just read your comment! I just placed my order through Zazzle and used “Disney World” on the front and spine. Did they let you edit your product then re-order? Or did you have to start all over? We are taking our second trip to WDW in October 2015. I love these binder ideas and will be making me one soon. I was wondering when you might have 2015 download information? Your site is a life saver! The planning of our first WDW trip has gone from daunting and overwhelming to super fun and exciting thanks to your website and videos. I can’t thank you enough! Hi there!! This binder is amazing!! I NEED this since I am planning a trip for 10 adults and 4 kids!! Can you tell me how you did your file folders and what images are on each one? Love this! but where did you get the dividers? What options did you do for a plastic tab? 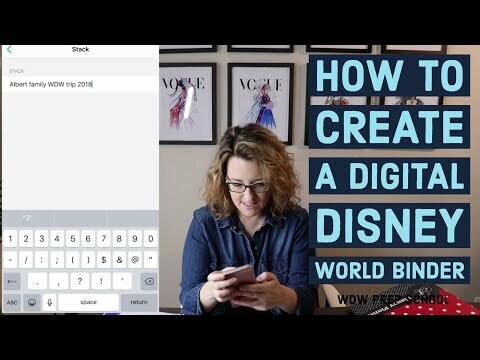 Hi Shannon – I just tried to order one of the binders on Zazzle and they cancelled my order because you are not allowed to use “Disney World” as part of the text. Just thought people should know! I would use “WDW” as an alternative. They’ve certainly tightened up their guidelines. Thanks for mentioning that. I just fixed it. For some reason the MK park map and the Epcot park mat will not let me open, send to email, print or anything? Anyone else having this problem? Or Shannon, any suggestions? Can you right-click (not left-click) the link and then you can choose to download it from there? Thank you, Shannon, for ALL of your time and energy! You and your website are so amazing! I get my Disney fix by reading your blog/FB every day. The revised downloads are beyond super. So appreciative! I absolutely loved the way you’ve reorganised this page. Its fantastic! Looking forward to using a lot of this for our Feb trip and will be making one up for the grandparents as an x-mas gift. I have a binder as well with all the information listed above (thanks to you Shannon) …I just need to get some dividers. Love the new design of this page. A great way to keep the information fresh! And the Zazzle tips are great. I have some referral credit of my own to use & planned on getting a binder. I never realized you could customize them like that. So cool. I just tried printing the “Ultimate Packing List” and the print view comes up with a mish-mash of letters/numbers. It may just be my computer, but wanted to mention it. Try right-clicking it so it downloads and then open it from your computer. What an incredible resource! Thank you! I especially love having all the resort maps in one spot. You’re the best! Hello! I tried to look to see if this has been answered before I asked. I do notice that a lot of great information is for 2013. Is this because not much has changed for 2014? My family and I are going in October and I absolutely love all of your information. I looked to see if you have gotten this question before and didn’t see it. How big is your binder? I am really interested in one, but don’t want to lug around a big school binder, and if it is the size of a regular binder is there an option for a smaller day planner size? Thank you so much!! i know its too early but I’m just wondering if you will eventually post 2015 updates when its available. Hello! Thanks for all the info! Will you be updating all the above links and printables to reflect 2014 hours/prices, etc.? We are going in late Nov/early Dec this year and I would love the most up to date info/printables! Do you have plans on updating for 2014? Your site is amazing!! I’ve been on it all day and I’ve found soooo much helpful information to use for planning my trip to Disney World. I love love love this binder idea! However, with the new Fastpass+, won’t the touring plans be affected? When will you be updating? 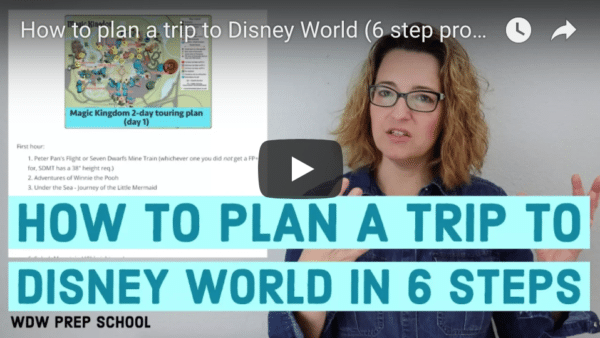 Your website, book, podcasts are a huge help in planning our Disney vacation. Keep up the good work! All of my recent posts have contained new touring plans for all of the parks and I’ll be updating old posts w/the new touring plans this week. Hello! I love these, are you going to update for 2014? How often are the charts updated such as the operating hours? We are going June 2014. I see it says June but when you open it says 2013. Just wanted to share how much I am enjoying your website! I have been to Disney World 25+ times…. (I lost count) but at WDW, there is always something new, something changing, and tips I forget. What a great resource – you are doing a great job with your website! I can’t get the transportation map to print out on one sheet of paper, what is going on? Can you make any suggestions? Hi there! I just stumbled onto your website while looking for clever things to do in Disney and let me just tell you that I love it! I’m very organized myself (planning the whole trip for me and my friend) and I’m OBSESSED with this organization!! However, I do have a couple of questions. 1) Do you remake this binder every time you go on a trip? If not, when do you update all of the information? 2) I probably won’t be able to go on many long trips, mostly 2 night 2 day park visits due to my few days of vacation at my job. I live in GA though so its an easy flight. How do you think would be the best way to organize this binder so that I can make it a multi-trip/annual disney info binder? 3) Do you have any other suggestions to keep myself organized? also where did you find the images for the tabs? Did you just make them in photoshop? Shannon, your binder and dividers are absolutely amazing! I’m a bit envious! If someone wasn’t as creative (like me) or wanted to save a little money on a binder, I just bought an adorable Tinkerbell binder on sale at Target for $2.00. I’m thinking about just designing my own tabs to insert as dividers. Your maps and other downloads are beyond helpful. Thank you for all you do! It’s a font called Chopin Script. You can get it at http://www.dafont.com/chopin-script.font. You are awesome & since I would never be able to do one myself I just might have to order yours! Question, do you bring out your whole binder to each park? When I went in May I just had a folder w/each days itinerary. Thanks!!!!! This binder is fabulous! Talk about inspiration! I’m a DIY scrapbook girl but the organization of this has helped tremendously! I was wondering if you have any updated links for MK photopass maps with the Fantasyland expansion!? Thanks so much for all of the tips and downloads! Shannon… OMG!! You have totally put my Disney planning obsession to shame. I’ve just been waiting for the summer 2014 reservations to open up so that we can book our trip and I think that I must have a planning binder. Thank you for all of the fab ideas… love it! I was thinking you could add a section about the rv parks or something because we are rving there! Thanks so much for all of this info! I’m making my binder this week! I LOVE this! I too, bring a binder full of info on our trips but yours is awesome!!! I can’t wait to get started on a new one! When does all the info for 2014 come out? Called WDW, 2014 prices will be released June 1, 2013. Yes I would like it too…we are planning late November early December 2014! I have been surfing your website for days now planning our upcoming trip in April. I LOVE your binder layout and you make it all so easy to recreate! I was just wondering where you have your printing done for some of the items (i.e. maps) that have a lot of color and detail. Thanks for all of your hard work on this site, it has been incredibly helpful. This is AMAZING!!! I am completely overwhelmed, but I hope the more I look at your site and study some of the things, I will understand a little better. Trying to plan our first Disney trip this summer 🙂 I see that you have updated most of the stuff for 2013…do you know where can i find park hours for 2013? All of the park hours are listed above in the General Info section. Park hours appear at those links before they appear on Disney’s main site. Did you design your binder as a “binder” or as a “scrapbook” in order to get the 12×12 size? What do you find as a benefit of having a larger sized binder? It’s a binder, not a scrapbook (I got it from an office supply place). I like the larger binder to fit all of the various info that I have. Many people have smaller binders and that seems to work for them. I am making one thanks to this awesome idea!! I made dividers, similar to yours, but in princess colors since we are planning the trip around my 5 year old DD and her LOVE for all things Disney Princess. I’ve been working on it for at least 3 weeks and I have lots more to do, but you are AMAZING – for making this, sharing this, and encouraging others to do so as well! Thanks a million!! Your blog has given me SO much inspiration! Thank you a million. your great ideas & your wonderful downloads! What a pretty binder….just curious — is this a mini binder or is it a regular size binder that holds 8 1/2 x 11 sheets? It’s a large binder – nearly 12 x 12. I found the pin on Pinterest and also commented. I would LOVE to have a binder like this but am not sure I could do such a wonderful job if I designed it myself. Please let us know if they make the exception! Good to know! I’l give it a try in a couple weeks. Glad you like the site! I’m a gadget freak, but there’s something about having it printed and organized in front of me that makes me happy (especially if a cute binder is involved :D). Me too! I love being able to see it and flip through the pages, haha! I had our honeymoon organized into a binder…not a super cute one, but a binder. It helped a lot, but so many people looked at me like I was odd. Not sure why! But this was Germany so who knows, lol. Better safe than sorry, and organized is definitely safe! I am so happy I found this though, I was already typing up things to print out but this makes it so much easier! Especially maps and schedules. Thanks!! Yea for flights being booked! I’d put that info in the General Info section personally, but obviously you can arrange it however it makes sense for you.